Rebecca Sibrack, who has called the Bay Area home for most of her adult life, is a versatile Edible Excursions guide. She leads our Ferry Building and Farmers Market Tour in San Francisco, Downtown Berkeley Brunch Tour, Berkeley Gourmet Ghetto Tour, Oakland Uptown Food & Drinks Tour, and Oakland Temescal Tastes Tour. When not bouncing around the Bay guiding guests on food adventures, Rebecca works as a personal chef and runs her own food business, Edible Explorations. A cultural anthropologist who has traveled extensively in Mexico and immersed herself in Oaxacan foodways, Rebecca specializes in regional Mexican cuisine. In 2009, she landed first place in the Mission Cultural Center’s “Mole to Die For” Contest for her mouthwatering Mole Coloradito. For many years this Oakland resident was a working member of the Juice Bar Collective (RIP) in North Berkeley, a former stop on our Berkeley Gourmet Ghetto Tour, which is how she found her way onto our team. 1. What's your favorite part of being a guide? Leading tours allows me to flex my extrovert storyteller side. I love showing guests around amazing, historic, delicious, and diverse neighborhoods and sharing my knowledge on the cultural and culinary front. 2. Where do you like to go when you dine out? I’m excited by the current trend of counter service spots helmed by some of our top, high-end chefs. I’m looking at you Hawking Bird, Dosa, and Brown Sugar Kitchen. Some of my all time favorite places to eat locally include Comal, Gather, The Kebabery, Imm Thai Street Food, and Cafe Colucci. 3. Can you tell us a little about your personal chef business? My goal is to nourish and fuel my clients and their families one meal at a time. Clients choose dishes from my seasonal menu, then I shop, cook in their home, leave their kitchen spotless, and their fridge full of food. I have a vast international recipe repertoire, and am well versed in specialty diets including gluten-free, vegetarian, paleo, and low FODMAP. Personal chef services are ideal for people who don’t have time to cook or aren’t interested in getting into the kitchen but want regular nutritious and delicious meals. A personal chef can be particularly helpful for people with special diets, new and expectant moms, busy families, and folks recovering from illness. 4. 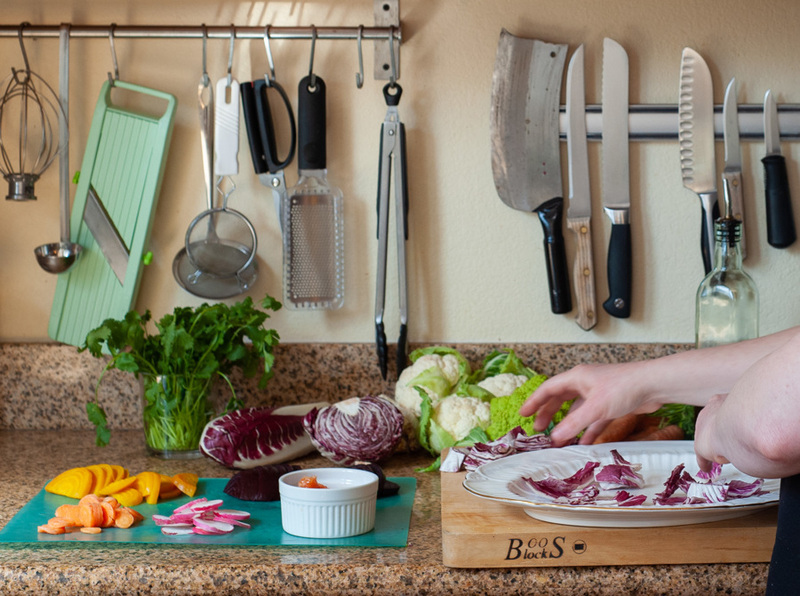 What kind of home cook are you? Depending on my energy level, when I come home from cooking for other people all day I either wish I had my own personal chef (and then make eggs! ), or I am inspired to make what I just cooked for my clients for myself. That said, it’s borderline embarrassing how often I have breakfast —hello again eggs—for dinner! 5. Where do you like to shop for food? There are many weeks where I visit at least three farmers markets - perusing produce is where I get endless inspiration and joy. One of my favorite parts of leading the Sunday Temescal Tastes Tour is when we start at the “DMV” farmers market. I always get perfectly ripe seasonal produce to share with my guests to kick off a tour. It is a special market; I shop there weekly for myself and my clients, and have developed relationships with many of the vendors, farmers, and ranchers. My other favorite market I’ve been shopping at for 20 years is the Tuesday South Berkeley farmers market - a great group of vendors and it’s a block from my house. Whatever I can’t find at the farmers markets, I get at Berkeley Bowl, which is where you’ll find me most mornings. Oaktown Spice Shop is a super fun store to smell your way around, and find harder-to-come-by spices and interesting spice blends. It is the only place I have found in the Bay Area that carries Chile pasillas de Oaxaca, an amazingly smoky, spicy dried chile that smells and tastes just like Oaxaca to me. I get everything else I need for Mexican cooking at Mi Tierra Market in West Berkeley. 6. What are your go-to cookbooks? I have way too many cookbooks, which I mostly use for reference and inspiration. The ones that are on regular rotation currently are The Essential New York Times Cookbook by Amanda Hesser (diverse, tried-and-true recipes with interesting historical stories and helpful menu planning); Samin Nosrat’s Salt, Fat, Acid, Heat (Her book offers inspiration and enthusiasm along with gorgeous illustrations. I also really loved her Netflix show of the same name); and This is Camino (I often turn to the larder section of this cookbook, and I like the conversational style of the recipes from chef Russell Moore.) I was saddened by Camino’s recent closing, it was my go-to birthday/special occasion spot for years. 7. What's your desert island food & why? Avocados, whole wheat sourdough bread, eggs, and sweet black licorice. I could easily subsist on those things alone, and I’d hit most of the food groups, right?! 8. Can you share some tidbits about the Berkeley tours you lead? I’ve been working in the Gourmet Ghetto for a decade, so my connections run deep, and I have lots of stories, especially about the Cheeseboard and Juice Bar Collective on the Berkeley Gourmet Ghetto Tour. Hot tip: You can get the Cheeseboard’s spicy green sauce (good on a shoe!) and half baked whole pies of the day at the bakery—thus avoiding the line at the pizzeria—and finish the pizza off in your own oven. One of my favorite spots not (yet) on our Downtown Berkeley Brunch Tour that I point out to guests is Asha Tea House. They source incredible teas, make their own boba, and serve delicious pastries from Third Culture and Firebrand bakeries. Babette’s, the cafe tucked away inside BAMPFA, is a hidden gem, even for locals (myself included before I started leading that tour). I think it’s fitting that a Berkeley art museum has an incredible sustainable cafe. We often have avocado toast on tour but everything on the menu is good, including their seasonal salads, rice bowls, and Joan’s pistachio cake. 9. Can you give us a little flavour from the Oakland tours? The Temescal Tastes Tour is jam-packed full of international cuisines. A guest recently remarked how surprised she was that we had eaten around the globe within just a couple blocks. Temescal is home to Oakland’s large Korean and Ethiopian communities, both of which are represented on tour. Recently, we’ve been wrapping up this tour with digestive teas and a cookie at Julie’s. The cafe has become a fast favorite. On some of our private Uptown Oakland Food & Drinks Tours we’re able to stop by Firebrand Artisan Breads. It is a stand-out, one of the best bakeries in the Bay Area. I especially enjoy their wood-fired, whole wheat sourdough loaves and their chocolate chip cookies. We usually start the public Uptown tour at Woods Brewery, which I love for their interesting beers, many of which use Yerba Mate instead of hops, so you get your upper and your downer in one glass! 10. And, finally, what about a sneak peek of your favorite Ferry Building food finds? Brown Sugar Kitchen just opened at the Ferry Building (hooray to delish fried chicken and bacon cheddar scallion biscuits), adding to the already long list of fabulous places to eat in that beautiful, historical landmark building. A shout out as well to La Mar, just a few minutes walk up the Embarcadero, where scrumptious Peruvian food is served in a gorgeous waterfront setting.